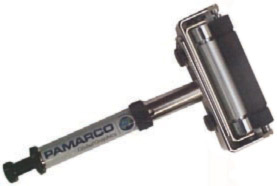 Each Pamarco Hand Proofer includes the Hand Proofer, rubber transfer roll and a spring-adjustable mechanically engraved anilox roll, (with a Path Width of 4-3/4”). The Pamarco Hand Proofer gives you more options — for testing on polyethylene, cellophane, glassine, metallic foils, plastic films, paper and paperboard. Plus, what you see on the proof is what you’ll print on press. Since proofer rolls are available in a full range of screens to duplicate your press requirements, you can make any changes in ink or screen before you get to the pressroom! A Precision Design With Precise Advantages - With the Pamarco Hand Proofer, accuracy is the first priority. The unit features both a unique locking device and a nip control switch that maintains a constant nip pressure, even when the nip is being engaged/disengaged. With stainless steel bearings on both the anilox and rubber rolls, draw-downs are smooth, even at high speeds and pressures. And, because of the “open” design, the Hand Proofer is easy to clean and maintain. Use it along with the automatic Pamarco Precision Proofer for perfect results every time. The standard model is listed below, otherwise specify tool reference number, pattern, cell count and BCM desired. To produce a sample proof: Start with a flat, clean sheet of the stock to be used. Adjust the anilox roller against the rubber roller by gradually turning the single vernier knob at the base of the hand proofer. A spring mechanism inside the handle makes it simple to position the rollers to get just the right amount of pressure. Put about 1/2 teaspoon of ink in the nip, rest the rubber roller on the stock, and draw the hand proofer toward you, smoothly and evenly. That's all there is to it. What you see on the proof is what you'll get on your flexo press.